Did you know that the sun not only damages your skin, but your hair as well? Here are five ways that you can protect your hair from the damaging rays of the sun. Take a break from the blow dryer, curling iron and flat irons a couple of days a week. Instead place your hair in a bun, braid or ponytail. How about some beach waves? You can also accessorize your hair with a pretty headband or barrettes. There are hair care products that contain UV filters for the hair. They come in spray, gel and cream formulas. They help to protect your hair from sun damage and protect your color from fading. Wearing a sun hat also helps. It will protect your hair, scalp, ears and face from over exposure to the sun. These are areas that are vulnerable to skin cancer. Products like Finesse Restore and Strengthen Moisturizing Shampoo along with Finesse Max Keratin Deep Conditioning Keratin Treatment are designed to give your hair deep penetrating proteins to help strengthen it and keep it looking healthy. This 5 minute weekly deep conditioning treatment is infused with repairing hydrolyzed keratin, vitamin E rich safflower seed oil, and moisturizing aloe. It helps to restore and strengthens dry, damaged hair. The treatment should be applied with a wide tooth comb to help distribute it evenly without further damaging the hair. It costs less than 2 dollars and has a great coconut scent. It can be found in stores like Target (check Target.com for a store near you), Meijer, HEB, Harmon and more. Keeping your hair well maintained is a great way to stay ahead of the damaging effects of the sun, like frizz. Be sure to get your hair trimmed regularly and apply an anti-frizz oil or serum to add shine before or after styling. You only need a tiny drop of oil. Any more than that can weigh your hair down and make it look limp. Before heading out to the beach or pool, wet your hair an apply a leave-in conditioner. This will help to keep your hair from absorbing as much saltwater or pool chemical. Also, be sure to rinse your hair after swimming to rid it of any excess chemicals or saltwater. Keeping a mist bottle with water and conditioner in your beach bag is a smart idea for keeping your hair moist. Disclosure: This is a sponsored post powered by Brandbacker. These are all great tips. I always limit how much I use hot tools. Great tips, my hair usually ends up a disaster by summers end. I'll definitely be trying these! Thanks for these helpful tips. I struggle with keeping my hair looking great over the summer. I especially like the tip about pre-treating before taking a dip in the pool. Thank you for all the tips. MY hair and skin is so dry right now. I wear a hat when I go out in summer, which protects my head and my hair. I love Finesse! I didn't know they had a deep conditioning Keratin treatment. I definitely need to try this!! Thank you for sharing. I need to try #3. I think it will help. There are some good tips here. My hair tends to dry out in the summer and I deep condition it at least once a week. Great information. My hair was so sticky and stiff all last week during the heat wave. I needed these tips. I cut back on using hot tools a long time ago. I found that they were making my hair brittle. I definitely need to do a deep conditioning treatment on my hair. It's easy to forget that the sun damages your hair. I will be using a deep conditioning hair treatment regularly this summer. I didn't know there was an UV protection for hair available! Thanks You! Great tips! I always do #2 when it's hot out and before swimming. I order product from Amazon. I always thought that sunscreen for the hair should be available in every drug store, but it isn't. Thanks for sharing all these great tips! Great tips! We spend a lot of time out in the pool and beach so good hair care is a must! I definitely need to look into getting a good deep conditioner! It will help because our hair can get so dried out from constantly washing it. Great tips,thank you. My hair goes dry and frizzy every summer. 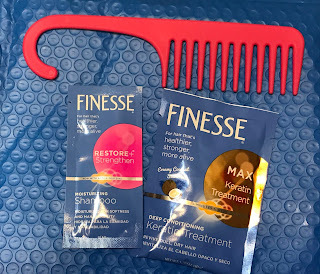 Just ordered the Finesse Max Keratin Deep Conditioning Keratin Treatment from Amazon - looking forward to trying it. I didn't know there were hair products with UV protection, that's a news! I do a conditioning keratin treatment every start and end of the summer so that my hair aren't dry and look like hay bales! Thanks for sharing your good tips. I don't use much on my hair as far as heat. A hair mask works great for moisturizing. I spend a lot of time at the pool and the chlorine does dry out my hair. I use a leave in conditioner to combat the dryness.